For most boys and their parents, the ceremony in synagogue is the climax of the bar mitzvah experience. After months of preparing, the young man stands on his own before the congregation and shows them what he has achieved. His performance successfully concluded, everyone breathes a deep sigh of relief—now they can relax and enjoy the party. First, and most importantly, a Jewish boy becomes a bar mitzvah on his thirteenth birthday, with or without a ceremony in synagogue. If he stumbles over a word, or forgets a sentence in his speech, he will not be disqualified. Putting too much pressure on the bar mitzvah boy to deliver a flawless performance will make the experience unnecessarily unpleasant for everyone. 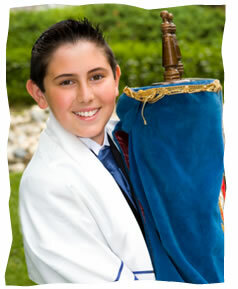 Second, while preparing for the ceremony may be a rewarding experience, it should not be the sole focus of the bar mitzvah boy’s studies. A thorough review of the fundamentals of Jewish observance is a much better preparation for life as a Jewish adult than simply learning to chant a few paragraphs by rote. Finally, when choosing a date, keep in mind that although the bar mitzvah ceremony and celebration are often held on Shabbat, this is not a requirement. In fact it may be preferable to hold the ceremony on a weekday (Monday or Thursday, when the Torah is read publicly). This makes it easier for friends and family who live at some distance to attend. If the ceremony is held on a different day from the party, it’s a good idea to make a small celebration following the ceremony itself. Ready to start preparing? Whether you’re a synagogue novice or a Shabbat regular, you’ll find everything you need in this section to do the ceremony right.